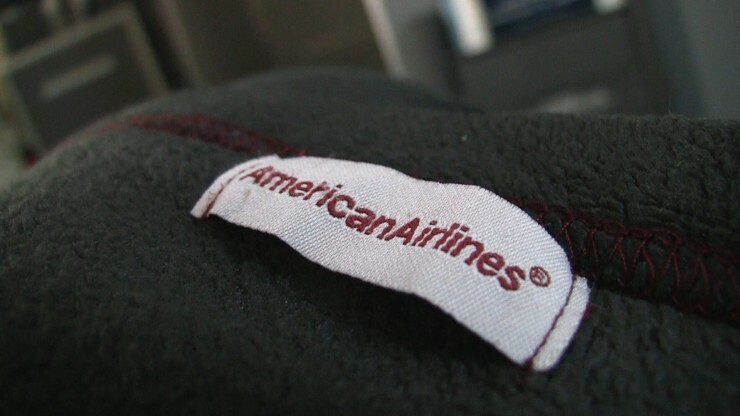 AmericanAirlines First Class upgrade comes with a blanket. Seat(s): These wide leather beauties still had that new seat smell. Even better was the relative comfort provided for this American Airlines First Class upgrade aboard an Embraer 175. All seats in row 1 come with good space for legs but in 1D, you’ll get a little extra if you angle yourself a little bit and extend past the bulkhead wall. The seatbacks are slim but provide decent cushioning and on the short to medium hauls these planes tend to fly, should be pretty comfortable. Seat width is average for domestic first. Tech/Connectivity/Entertainment: Wi-fi and power outlets should be available on your flight. We seem to have missed the outlets (they SHOULD be housed near your legs in base of one of the armrests). Wi-fi wasn’t yet active on this new plane just yet. Our American Airlines First Class upgrade came with a full meal, but we skipped straight to desert. upgrade and we knew food was coming on flight #2, so we skipped this meal. A sandwich and salad option were offered but we stuck with American’s signature mixed nuts and a brownie to go with coffee. Service: Service at Newark was just okay but better than what we tend to get from the airports most prominent carrier (rhymes with United). Once on board, we found a flight crew that was refreshingly eager, cheerful and helpful. The flight attendant in first even took time to geek out with us as we passed the new American Airlines Dreamliner parked at it’s gate in Chicago. How we got em’: This was a Modhop-style special occasion to fly in Business Class aboard the then brand-new American Airlines 787 Dreamliner. This upgrade was just a bonus. To get it we used a one-way saver level AAdvantage award (25K miles) fron Newark to Dallas via Chicago.